As mentioned in yesterday's post, this week will kick off a special series of posts. This is the beginning of an eight part series of posts giving instruction in how to get started with spirit conjuration. Please like and follow us on Facebook so that you won't miss any of the action, and please share the series so others you know can also enjoy it. A few months back a brother from a neighboring body reached out to ask for recommendations for people looking to get into conjuring spirits and grimoire magic. Rather than give a simple quick answer I figured it would make more sense to put together a list of book recommendations and post them because others might benefit from it too. Unfortunately for the last couple months some stuff has gotten in the way of blogging for the most part, so I'm a little behind, but we're going to get started...with that book list. In thinking on it though, there's other stuff we can talk about than just books. So we'll do a few posts going over some practices and skills as well. In thinking about what books to read you probably want to also think about what kinds of spirits you want to conjure as well as what skills you'll need to develop to work with them. A lot of basic beginner magic books don't really teach traditional magic or the worldview or practices involved therein. Instead they teach stuff like developing mental awareness, capability scrying, an understanding of correspondences, the elements, talisman construction, and basic ritual techniques. While a lot of elements of modern magic are used for different purposes and in different contexts than in traditional magic, a grounding in modern magic can be useful. Israel Regardie's Tree of Life, and The Golden Dawn, along with Crowley's Liber E, and Liber O will provide a lot of the basic modern foundation that you'll find useful. Norman Kraft's Ogdoadic Magic will give a bit more accessible approach to describing modern magic. More to the end of developing as a ritual magician, and one which I enjoyed as a teenager, is Steve Savedow's Magician's Workbook. Steve also wrote a book on modern Goetia based on working with the Goetia of Solomon, and released an edition of Sepher Raziel HeMalach. So his approach to Golden Dawn style magic was at least focused towards the kind of ritual magic that fit a Golden Dawn interpretation of the grimoires, even if some of his interpretations of spirit work aren't perfectly aligned with traditional magic. Angel Magic by Geoffrey James (who also released Enochian Evocation of Dr. John Dee) was a significant influence on me as a teenager. His book is a survey of ideas and history surrounding the conjuration of angels. It introduced me to understanding some of the mechanics of talismanic work that I later found described more fully in alchemical philosophy and the work of St. Thomas Aquinas. This book won't teach you to conjure spirits but it will introduce some useful ideas and stories. For more on gaining a grounding in the ideas and ideological context of grimoire work, the books in the Magic in History Series are incredibly useful. With these it really depends on how deep you want to get into exploring grimoire tradition and the history of magic as to how many of these you should read. If you mostly want to get into practice, I'd recommend checking one of these out, preferably one containing a grimoire, but you probably don't need more than that. If you want to develop a full sense of how grimoire magic developed and various forms of traditional magic, exploring as many of these history books as you can would make sense. The book is not actually a sequel to three books of occult philosophy. Most of it is not written by Agrippa. On Magical Ceremonies may have been written by him and is largely a practical summation of the information provided in Three Books of Occult Philosophy. Three Books of Occult Philosophy essentially presents the system of magical thought from the grimoire period, but it is a pretty large book and takes a lot to get through. If you want to get started, On Magical Ceremonies is a lot more accessible. The collection also contains The Heptameron and The Arbatel. I definitely would recommend the Heptameron as a baseline for looking at the grimoires. It contains a lot of the grimoire orations and conjurations which appear in other popular grimoires. It presents a lot of important correspondences for spirit magic which also show up in later texts. The Arbatel is one of the simplest approaches to spirit magic. The Olympic Spirits are powerful and interesting spirits. They also are very eager to work with magicians who approach them correctly. There really isn't ritual or tools or a ton of correspondences involved. Work with the Olympic spirits could be one of the easiest ways to get started. The Magical Calendar includes a lot of correspondences used in the grimoire tradition broken down into numerical tables. Three Books of Occult Philosophy contains similar tables, which are more extensive, in Book Two. These correspondences can help you with picking spirits with which to work, or determining how the various spirits relate to each other and to various situations and times and locations. These texts collect together manuscripts by the somewhat mysterious Dr. Rudd. Rudd most likely was around a generation or so after Dr. John Dee. Like Agrippa and the Magical Calendar Rudd's work explains many correspondences useful in medieval/renaissance spirit magic. It also has Rudd explaining various concepts of magic such as talismans and image magic, explaining various types of spirits, various symbols of astrological magic and other similar topics. Rudd also presents info on spirits less commonly addressed in modern approaches to spirit magic, and he is a good example of linking Scholastic Image Magic with Grimoiric Ritual Magic. 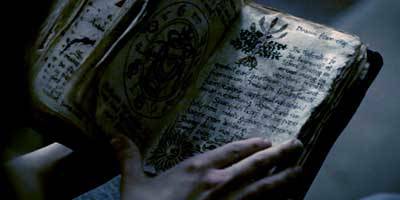 Rudd's work also includes Rudd's own grimoire and his approach to blending Enochian material into grimoire magic. This is a pretty short text which you can get online. This presents a very simply form of crystallomancy or conjuring a spirit into a crystal. It's based on working with the seven planetary spirits but the system can be used for any sort of spirits. It uses very few tools, and not a lot of rituals, just a few simple prayers. In particular it is a very good introduction to how an altar has specific elements for manifesting spirits in grimoire magic. For a lot of magicians this work inspires their standard means of working with spirits. This book is pretty big and expensive. But it is fricken beautiful. It has images of the original manuscript pages, and these take up the bulk of the book. The manuscript pages have beautiful illustrations of the talismans and the book is printed on a really nice glossy paper. On the negative end, the actual “critical edition” of the text is only a very small portion of the otherwise huge book. That said, the book is essentially a pair of grimoires, with a handful of spirit conjure rituals sandwiched between them. The section by Sibley is very useful because unlike most grimoires which just collect prayers and descriptions of tools, Sibley is writing something halfway between a grimoire and a book about grimoire magic. Sibley was writing only a few generations before the occult revival that produced the Golden Dawn, so by this point books about magic, as opposed to simply books of magic, were starting to appear so Sibley gives a much more accessible series of instructions than we find in a lot of grimoires. This isn't the best version of the Key of Solomon available but it was the standard version everyone had for a long time. This was what I used for my first formal approach to spirit conjuration. It provides talismans for a lot of different purposes, and clear instructions for making tools and putting together your ritual. This is kind of the baseline of Solomonic instructions. This is probably the best version of the Key of Solomon currently available. This collects several different variants of the Key of Solomon. In addition to providing a full exposition of how to create the tools and how to do Solomonic Magic, but more importantly it provides several ritual instructions aside from the main conjuration method, and provides several different purposes for the system far beyond what one might generally connect with Solomonic magic at first consideration. It shows the breadth of Solomonic magic as a system. So, in addition to these, again, I would recommend Agrippa's Three Books of Occult Philosophy. But don't let that slow you down in getting started. Read a handful of these, especially the ones that are easily accessible, and then start doing the work. As you do the work, keep studying and reading and expanding on how you work. Look into other traditional forms of magic like the Papyri Graeco-Magicae. Traditional Witchcraft, and traditional forms of European and Caribbean syncretic sorcery because these can also present ideas that are useful for consideration in spirit conjure and sorcery.